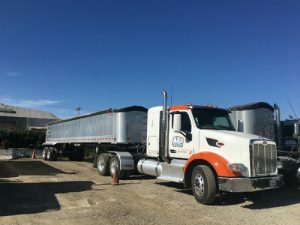 18 Trucking, a construction trucking services company based in Hayward, Calif., is reporting reductions in maintenance costs and less downtime for its fleet after switching to Neste MY Renewable Diesel. Neste MY is a low-carbon fuel produced from 100% renewable and sustainable raw materials, primarily wastes and residues, explains Neste. Cutting greenhouse-gas emissions by up to 80%, it is a drop-in fuel that requires no blending and no engine modification. Diesel particulate filters (DPFs) are an engine aftertreatment system designed to reduce emissions from diesel engines. Because they become clogged over time from soot and other particulate matter, the vehicles must routinely be taken out of service to clear these systems of the backup, explains Neste.